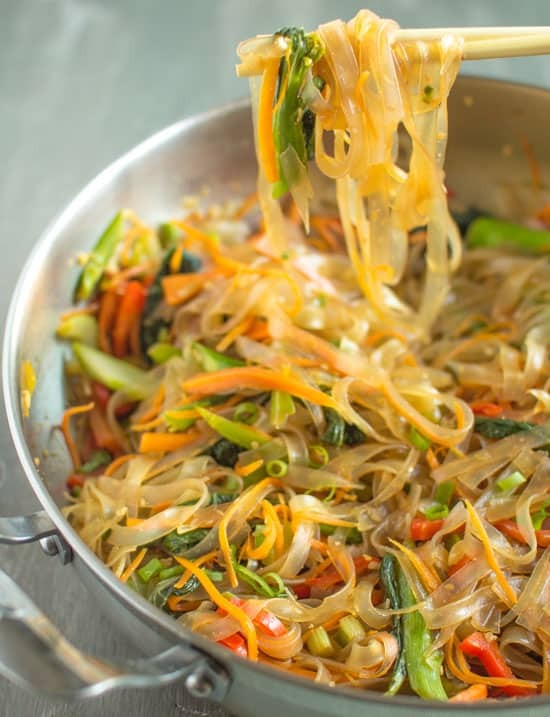 These vegetable stir fry mung bean noodles is one of my go-to dishes when I have less than 30 minutes to whip up a meal. Filled with a rainbow of delicious vegetables, this dish is vegan and gluten-free! I don’t hold my chopsticks properly, and that’s the cold, hard truth. Legend has it that I had perfect form when I was a little chitlin but somehow lost it over the years. I blame it on my siblings’ bad example. I suppose I should find solace in the fact that I don’t hold chopsticks like drumsticks or ask for a fork at a Chinese restaurant. That would be the ultimate form of humiliation if you look like me. I didn’t want you to see how I hold chopsticks like a pencil, so I solicited the help of a hand model in exchange for food. It’s a fair deal. My mom always dedicates an entire shelf in her kitchen to dry noodles. There’s egg noodles, seasoned egg noodles, flat rice noodles, mung bean noodle threads, instant ramen (my brother’s contribution)—nearly anything you can find at an Asian supermarket. If you ask her why she needs so many noodles, I’m sure her answer would be that there is a time and a place for everything. Well, this is the time and the place for some flat mung bean noodles. The beauty about mung bean noodles is that they’re gluten-free (made with mung bean and potato starch). They usually come in the form of small cakes, and they’re a whiz to prepare. Just dump them in a pot of boiling water and they’re ready in minutes. Good for those days when you’re semi-lazy to cook (because let’s be real, if you were too lazy to cook, you’d order some takeout or delivery). Picking up a few of my mom’s habits, I usually stash a bag of dried noodles or two in my pantry in case I need to cook a meal in a pinch. 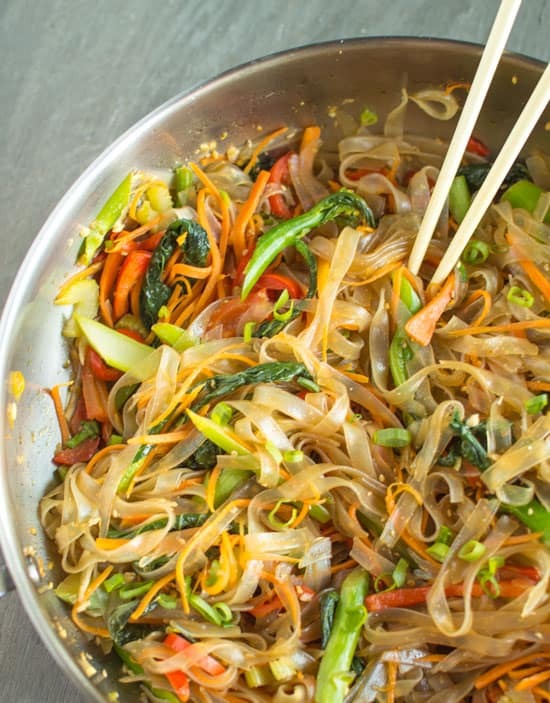 These stir fry noodles take only 25 minutes to prepare. Ready in a pinch! You can also see my complete noodles archives here. Fill a large saucepan with 3 to 4 inches of water and bring it to boil. Drop the noodle cakes into the boiling water, and let it cook for about 4 to 5 minutes or until the noodles look translucent. Drain the liquid and run the noodles under cold water. Heat a large stir fry pan with olive oil over medium-high heat. Once the pan is hot, add the onions and let it cook for a minute. Add the celery, garlic, ginger, chili and stir until the onions start to brown. Add the Chinese broccoli and cook for 2 to 3 minutes before adding the carrots, pepper, and green onions. 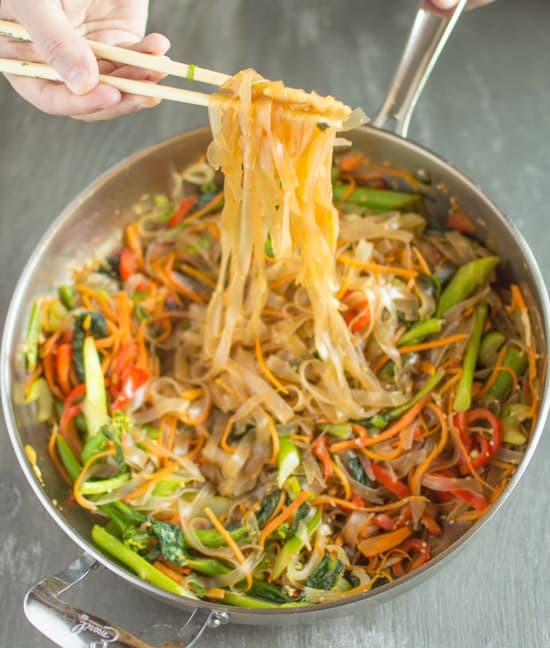 Once the Chinese broccoli turns into a bright green, add the noodles and stir. 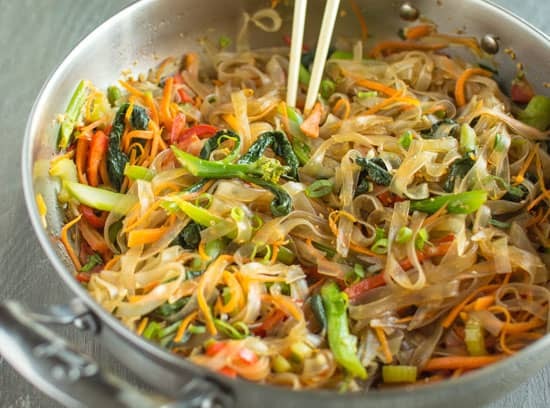 Mix the soy sauce, sugar, and sesame oil in a small bowl, and pour into the noodles and vegetables. Cook for an additional 2 minutes. Sprinkle sesame seeds on top, and serve immediately. This looks wonderful! I love noodles. Pretty pictures, too! Yes! Totally fabulous! I’ve never had mung bean noodles! Thanks, Rebecca! I could be wrong, but they might sell them at Whole Foods! Otherwise, You’d have to go to an Asian supermarket. I see them all the time, just never took the plunge and bought them! This looks so beautiful and delicious!! I’ve never had Chinese broccoli before – is this similar to broccolini and can I find it in a general grocery store? Thanks! Thanks, Whitney! Chinese broccoli (sometimes called Chinese kale too) is very similar to broccolini except the stalks are thicker and they have much more leaves. I’ve only seen them in farmers markets and Chinese supermarkets. You might find them labeled as gai lan, which is the Cantonese name for them. This was the most delicious recipe ever, thank you so much! I used a few drops of stevia instead of the brown sugar, it tasted great. Thank you so much for letting me know how it turned out for you, Gorgeois! And thank you for your kind words! That’s great that you modified the recipe to suit your taste. This recipe is fantastic! We enjoyed this for dinner tonight and loved it. Thank you for sharing! Christa, Thank you SO much for trying out the recipe and for leaving me a comment! Glad you enjoyed it! You made my day! Is it really just 4oz of noodles or 16oz (4 x 4 oz)? I just made it with 4 oz and it does not look like nearly enough for 4 servings. Hi Olivia, Thanks for catching it. It should be 8 ounces of noodles. I’ll change the recipe to reflect that. Thanks! Hi Anela, thanks for catching that! This is a wonderful recipe. I made it with the regular broccoli that I had, really delicious! I’ll make it many times. Thank you for trying the recipe and for letting me know how it turned out! I’m so glad you enjoyed it! This sounds delicious! I think I’ll substitute honey for the brown sugar- I’ve done that with their recipes in the past and it tastes great. Any suggestions for a good protein to add to this? Honey works very well with this recipe, too! I would add tofu or chicken to this dish. Hope that helps! Mung bean noodles are amazing healthwise , & taste great too. Have been using them since 4-5 years. Have a regular stock at home .Thx for sharing a healthy & colourful recipe. Was wondering if you knew of a substitute for soy sauce in this recipe? Or any recipe? 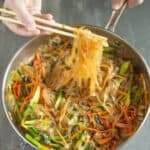 I have found this recipe: http://allrecipes.com/recipe/92873/soy-sauce-substitute/, but I have not tried it yet. Do you have any feedback or sense as to whether it might work? Just trying a new elimination diet so I’m doing away with everything that tastes good. Hi Lisa, soy sauce is the main seasoning in this recipe. Have you ever tried using coconut aminos? It’s a blend of coconut tree sap and salt. Perhaps that would fit into your elimination diet? Just took the plunge & tried the mung bean noodles! They were so delish! I soak mine in cold water for 15 mins then add to my stir fry veggies [including bean sprouts, garlic & mushrroms] using a solid vegetable broth. It comes out so seasoned & fresh. Thank you for sharing your recipe. Thank you for trying it, Carmen!! I’m so glad you enjoyed the noodles!